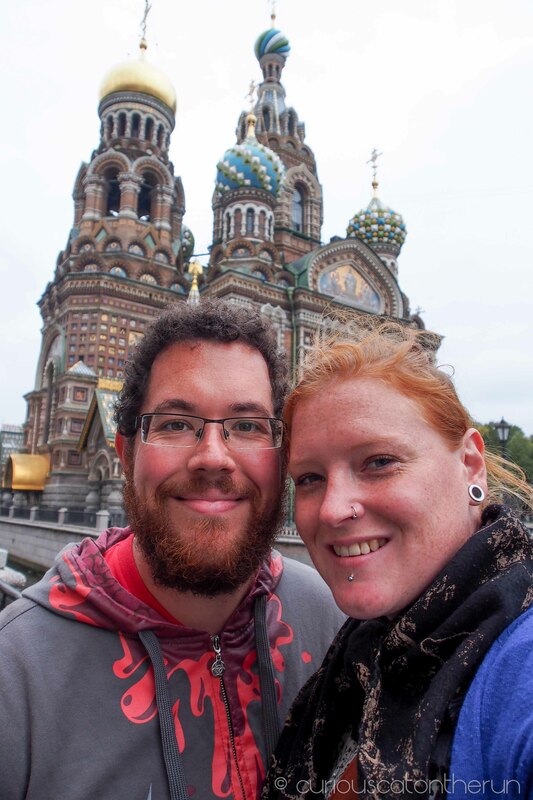 We’d looked at our options for travelling from Moscow to St Petersburg, and we weren’t too impressed. Everything was so expensive! We couldn’t believe there was no bus, and while trains were rather costly flying was even more so. 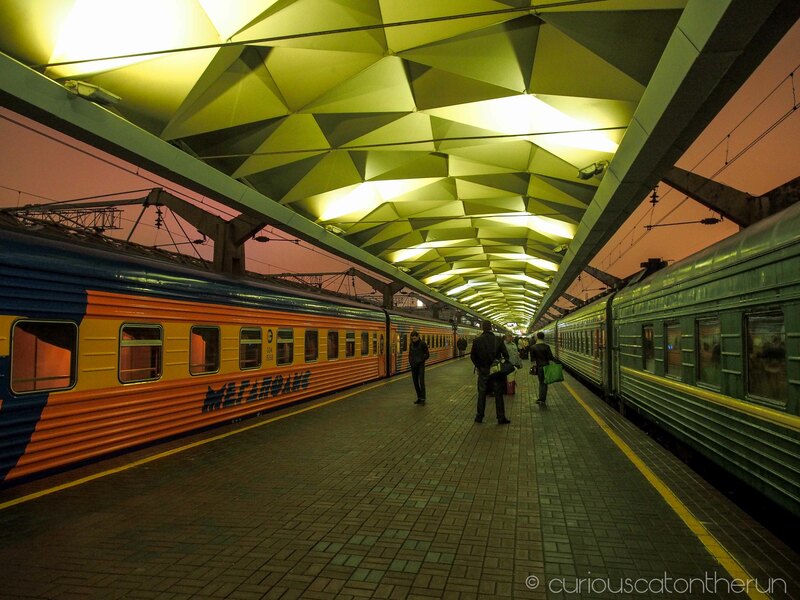 And so we decided to take an overnight train. 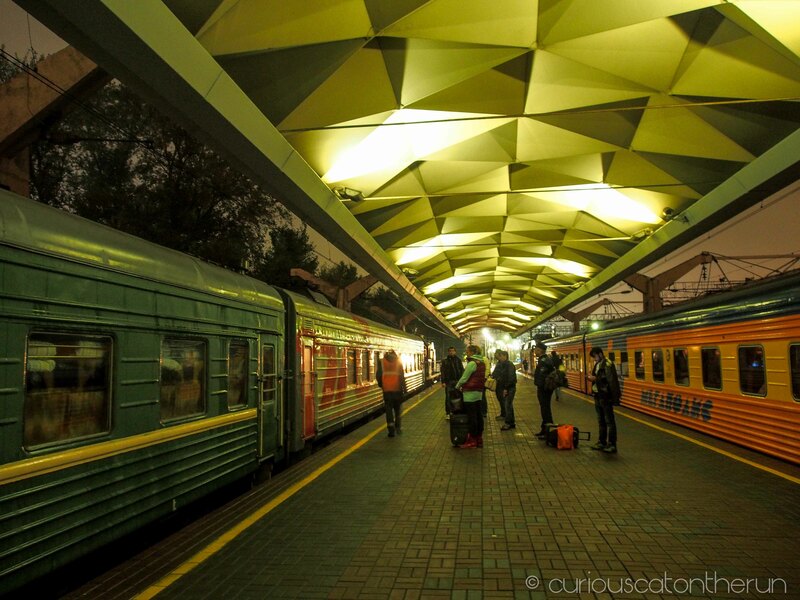 We’d planned to take a day train the following day, but the day train was even pricier and besides, we didn’t really want to stay another night at our horrible Moscow hostel despite having already paid for it. We stayed at Da! Hostel in Moscow, and it had a great location just off Arbat St. It was well set up for a hostel, the staff were reasonably helpful and it was bright and colourful. The atmosphere, however, was simply terrible. Like a number of hostels we had stayed at, it doubled as a rooming house. For something crazy like around sixty people. We were on the top floor and as far as we could tell we were the only travellers. We shared an 8-bed dorm with seven people who lived there [a couple shared the bunk below me]. We could barely even get into the room, as they all had so much stuff that they’d brought their own wardrobes, and yet every inch of floor was covered with their clothes and suitcases. The windowsill was piled so high with smelly, filthy clothes that you couldn’t see out of it. And every time we came back to the room, the locals living there had moved our bags. We felt so uncomfortable just being there. And the room reeked. Clearly no one ever cleans it. We couldn’t use the common room or kitchen as it was always full of the people who lived there, and they really weren’t friendly. We tried talking to people, but they had no interest and were quite rude. They acted like we were invaders in their territory and they were none too happy about it. I get that they’re paying to live there, but surely they’re aware that it’s a hostel and travellers have just as much right to use the facilities as they do – we’re also paying a lot more than them. The people living there ranged from students to couples in their sixties or seventies, who glared angrily at us while ironing their clothes every night. It was incredibly awkward. We were not happy, as the hostel information online had said nothing about the fact that it was a boarding house. I don’t know if travellers are a majority at the height of peak season, and I understand that they’ve got to make money. However, if we’d been given any honest information about the hostel we’d have stayed elsewhere. So we were happy to leave and not spend another night there. We took the metro to the train station, and were surprised to find that the train we took was the most modern we’d seen so far. It was far more comfortably appointed. We basically went straight to sleep, as it wasn’t a long journey and we didn’t want to get to St Petersburg exhausted. 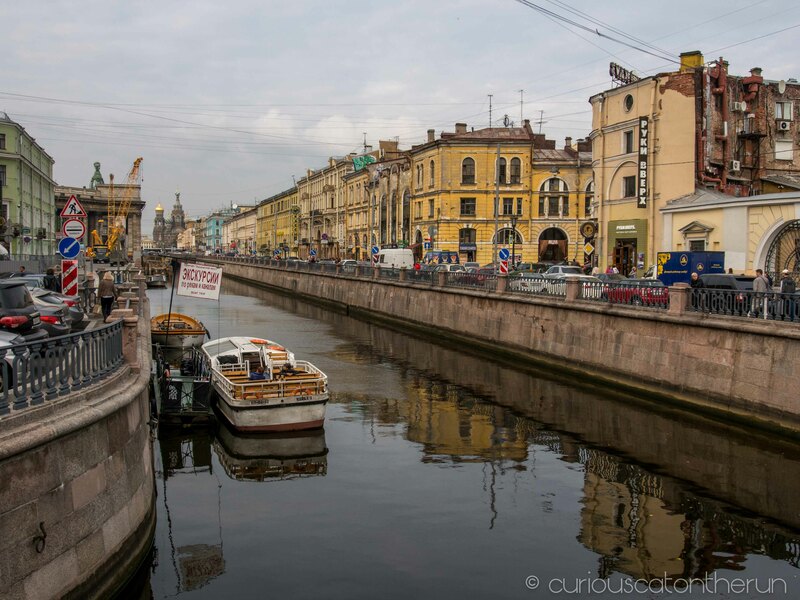 We arrived in St Petersburg early, and took the metro to our hostel – Baby Lemonade. It was only a short walk and we were pleased to find that there was only one flight of stairs, and the hostel was actually a hostel, not a giant rooming house. It was beautifully decorated and we were able to relax for a few hours before going on the hunt for breakfast. 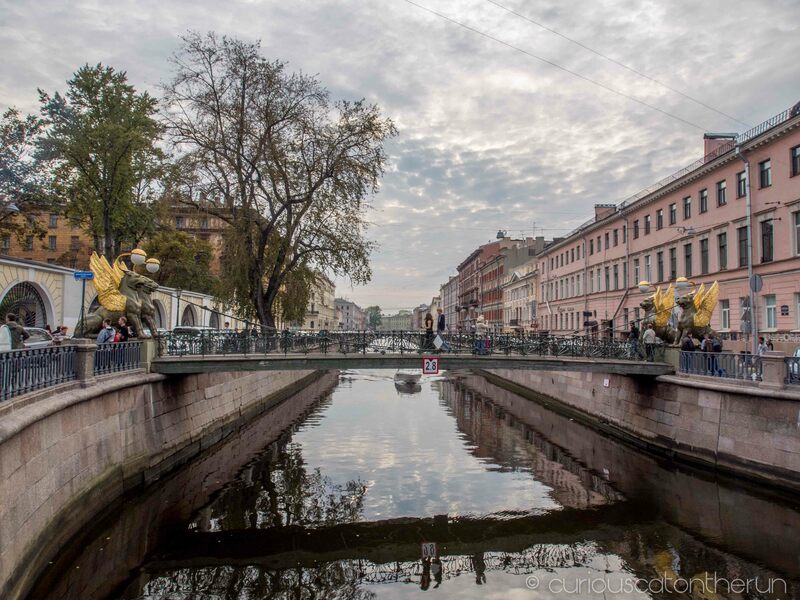 Walking around St Petersburg, the city felt very different to Moscow and other Russian cities. It felt far more European than Russian. Built on lots of canals, every other block was a bridge and we watched tourist boats chugging through on canal tours. We planned to do one, but it was one of those things we just never got around to. 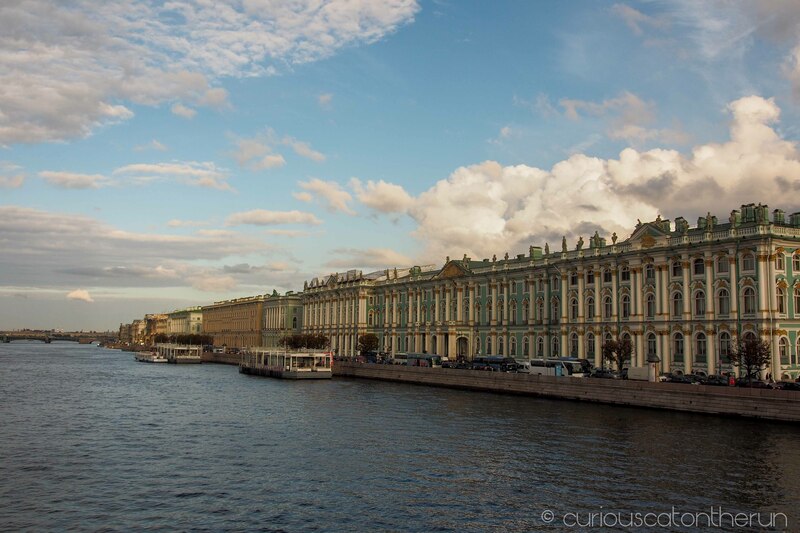 St Petersburg is lovely. 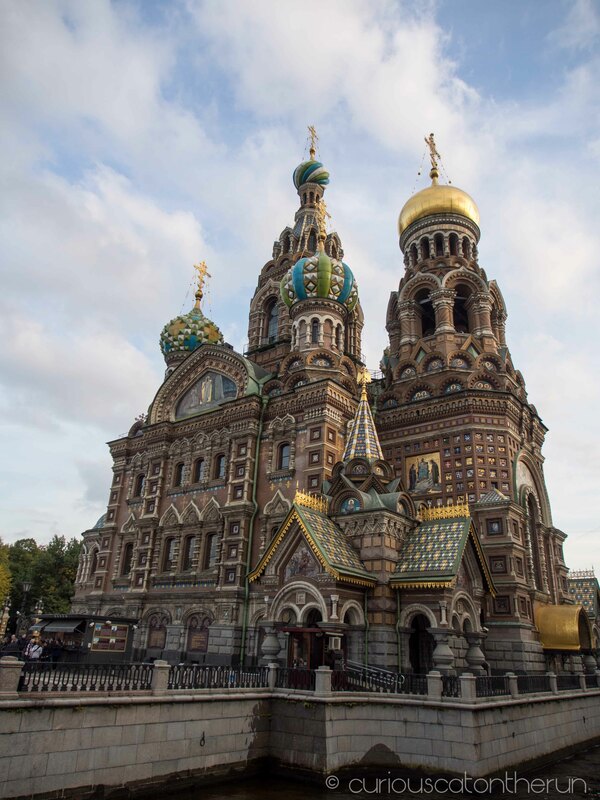 Founded in 1703 by Tsar Peter the Great, it’s had a few name changes in its history – to Petrograd in 1914, to Leningrad in 1924 and then back to St Petersburg in 1991. It’s pretty, it’s slightly chaotic, but it’s almost all walkable. We enjoyed just strolling the streets, taking in the sights around us. Our hostel was in a pretty good location, a short walk from one of the main streets and within walking distance of the Hermitage. Plenty of restaurants, bars and museums were also nearby, so we had less need for the metro than we had in Moscow. We did, of course, still use it to explore! Architecturally, the city is wonderful. 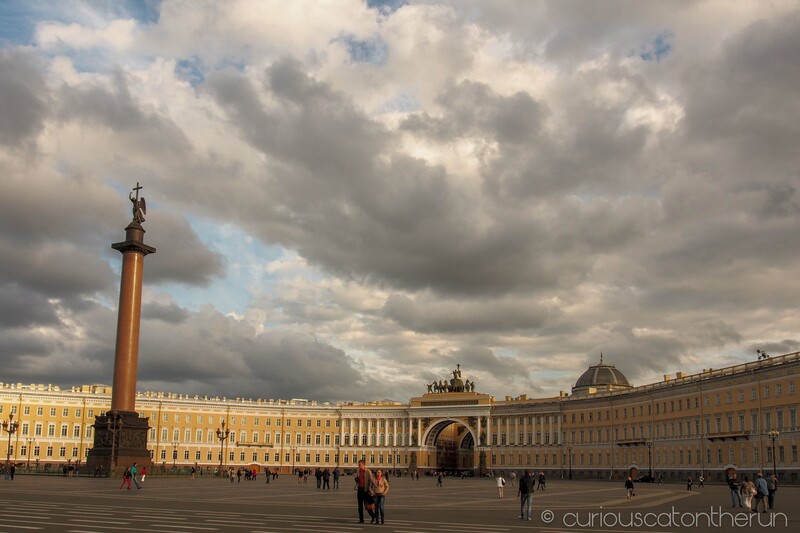 Palace Square, where the famous Hermitage is situated, is immense and beautiful. Magnificent churches, many undergoing restoration, litter the streets leading out from here. Across the river lies the famous Kunstkamera, with a fascinating museum I’ll mention in another post. We walked along the riverbank, on both sides, and the views were simply beautiful. We spent a lot of time walking around and just taking in the sights. I particularly liked St Isaac’s Cathedral, which doesn’t really fit in with the European styles of St Petersburg. A distinctly Moscow-style church, it looks very similar to St Basil’s in Moscow but in duller colours. It sits over a canal and is rather photogenic. It appears to be a popular place for wedding photos, as we saw quite a few brides around. We didn’t go inside. We were having a break from churches, or at least from paying to go inside. John doesn’t enjoy them, and when you’re on a budget entry fees add up! Sometimes it’s nice to just look at them from the outside – plus, it gives a reason [or adds to the list of reasons] to go back. I really loved the canals. It felt so different. Street run alongside the canals, and quaint colourful buildings make the whole place just gorgeous. I wish we’d got around to taking a canal boat tour – I think it would have been quite nice – but again, it’s just another reason to go back. I know I’m not done with Russia yet. There’s another trip there one day. Superb photos and very well written.